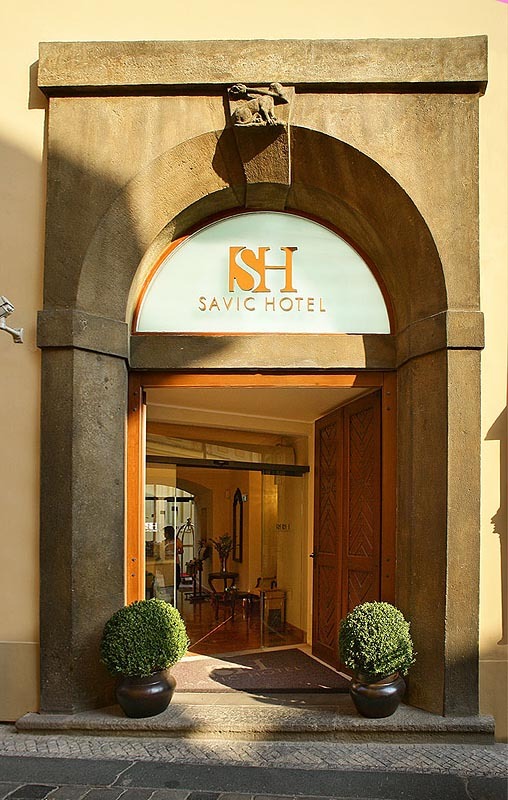 The Dominican hotel (old name: Hotel Savic) is situated in the heart of the city centre at Old Town Square, just a few steps away, on the cobbled streets near the famous "Astronomical Clock". 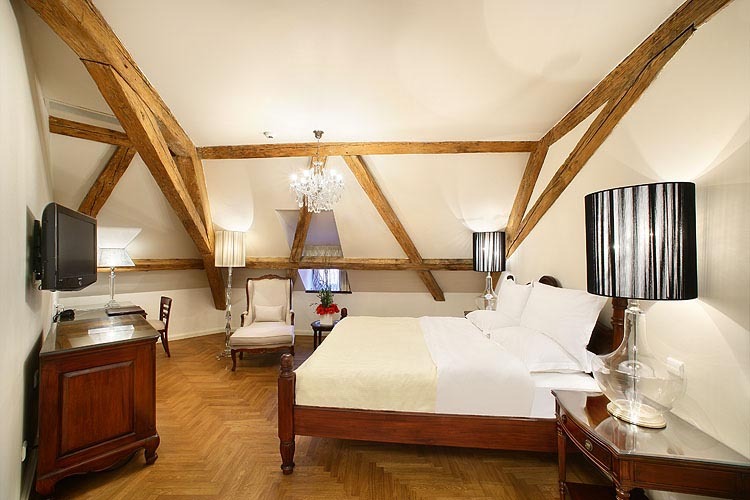 It is surrounded by the most significant historical landmarks of Prague, like the Charles Bridge, the National Theatre and the Wenceslas Square. 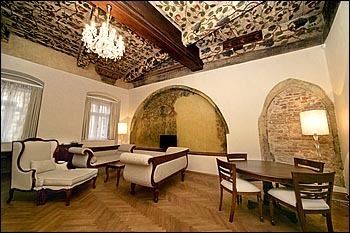 This Gothic and Renaissance building, part of the Dominican convent, which has in it the original ceiling in certain parts belonging to the year 1319, is one of the few in Prague. 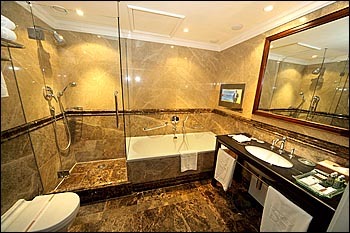 We offer 27 fully air-conditioned rooms (16 doubles, 6 twin, 1 executive and 4 junior suites). 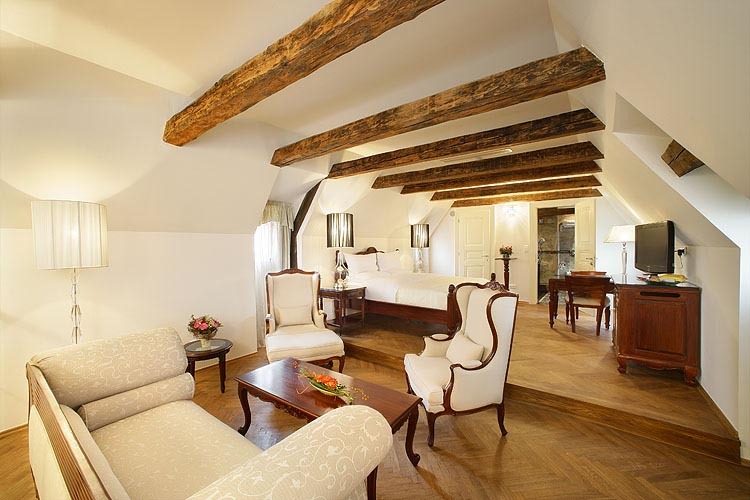 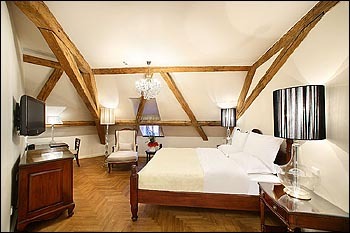 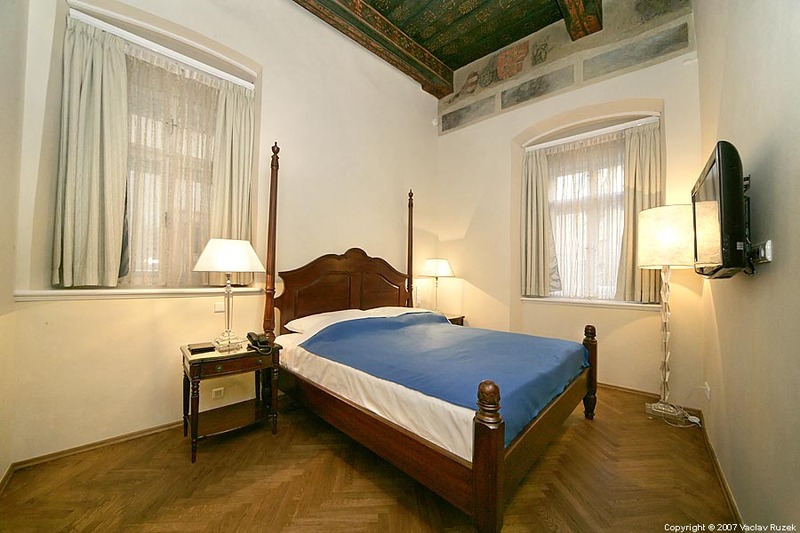 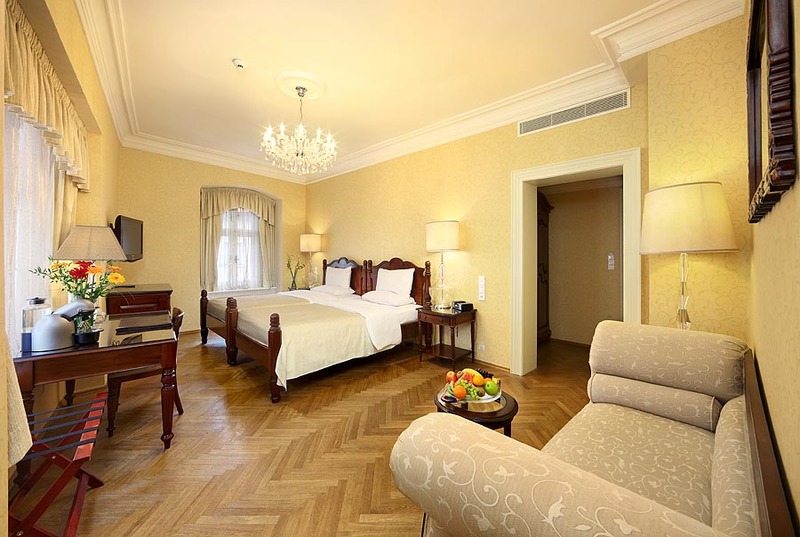 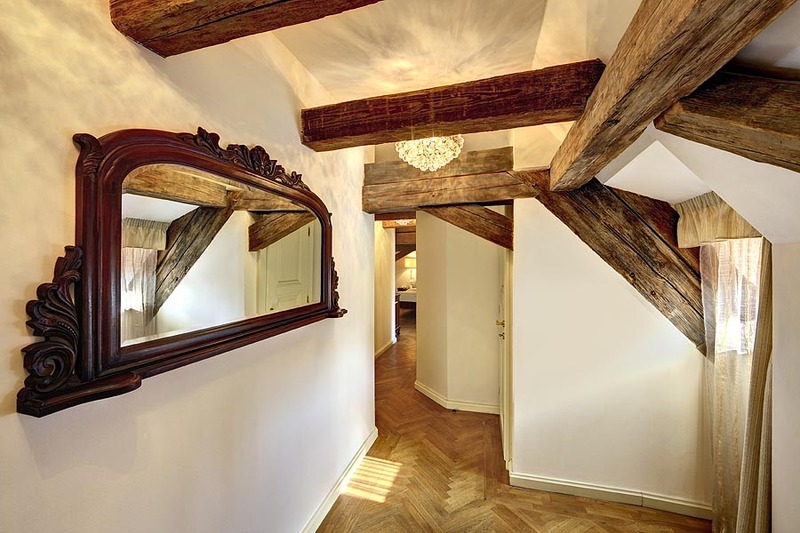 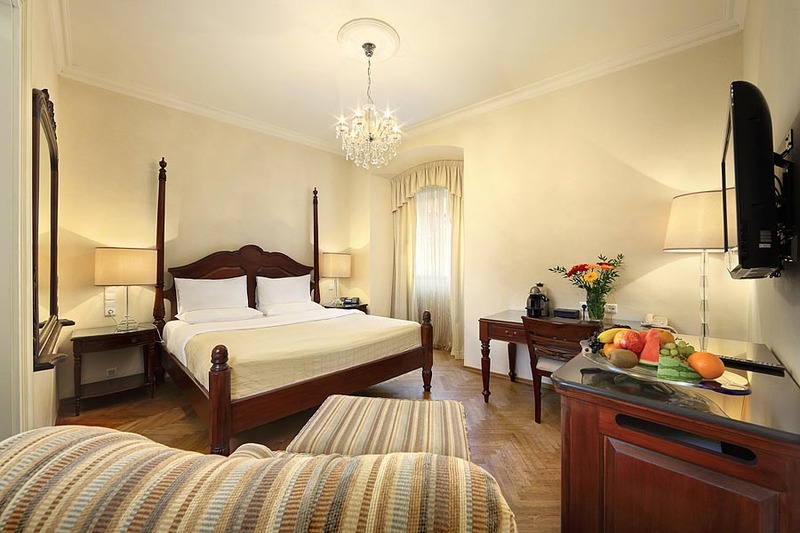 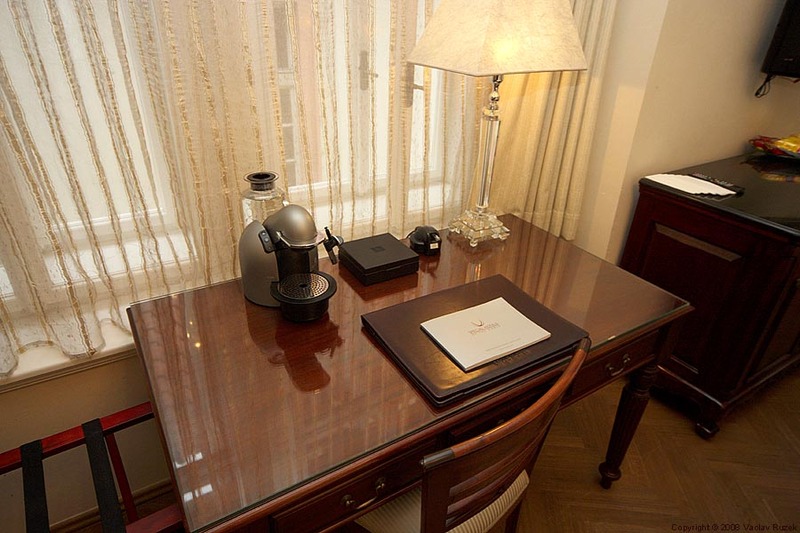 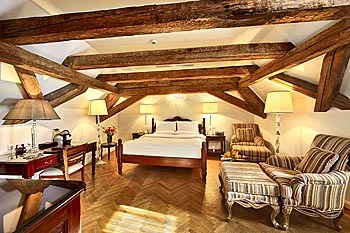 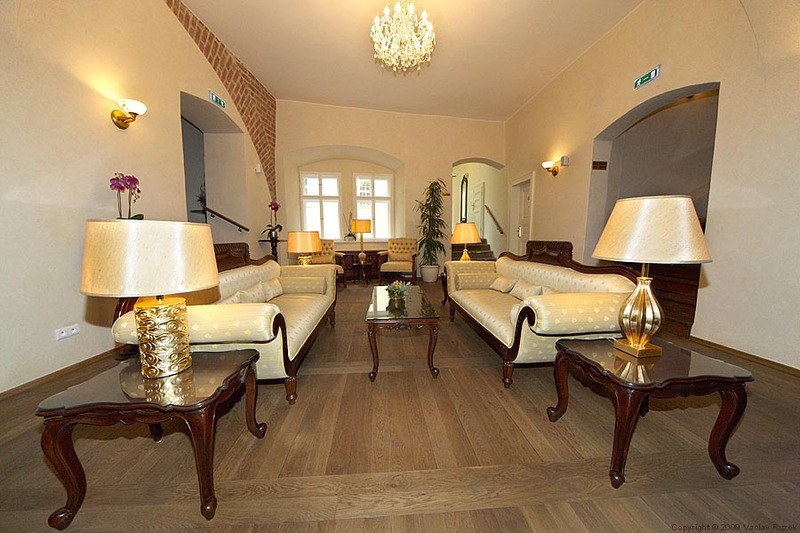 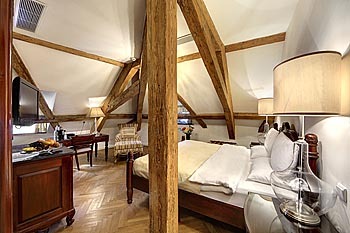 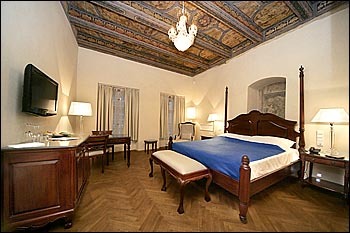 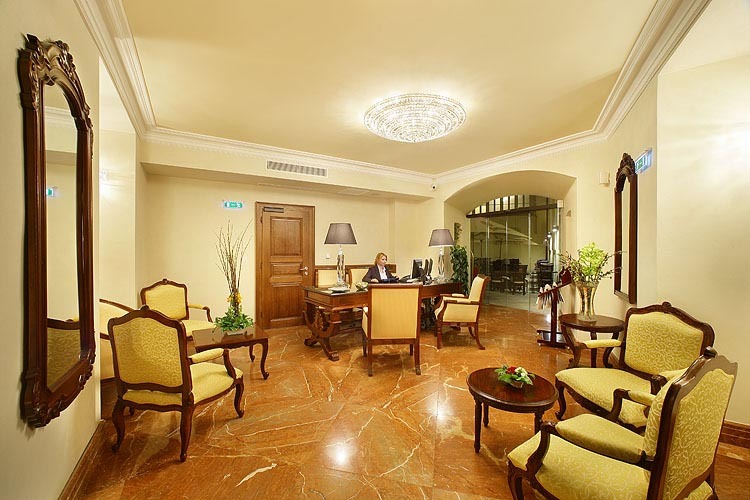 All rooms are furnished with classical furniture made of mahogany wood and original parquet flooring. 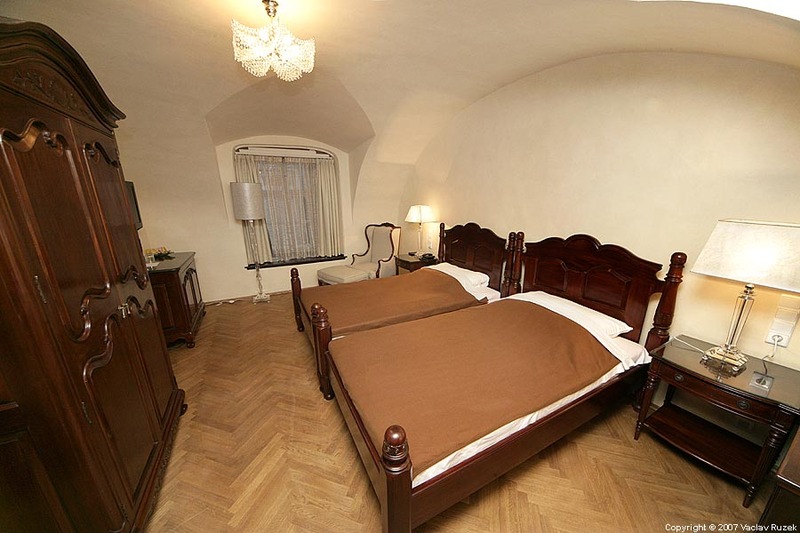 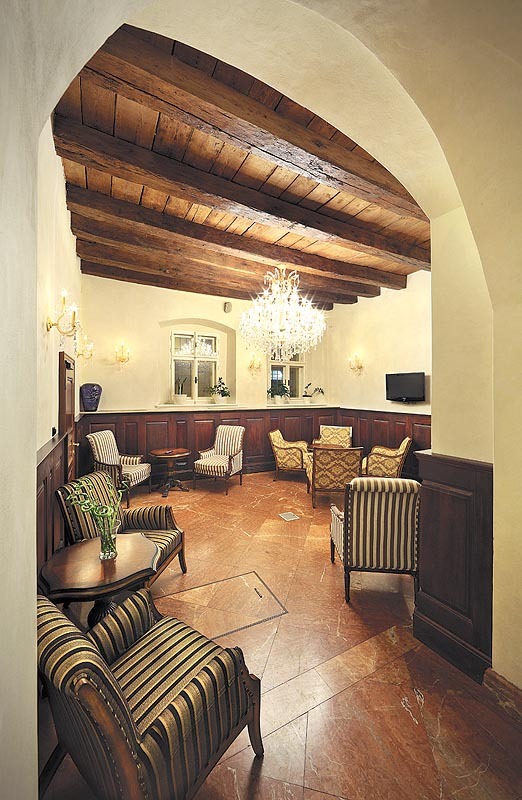 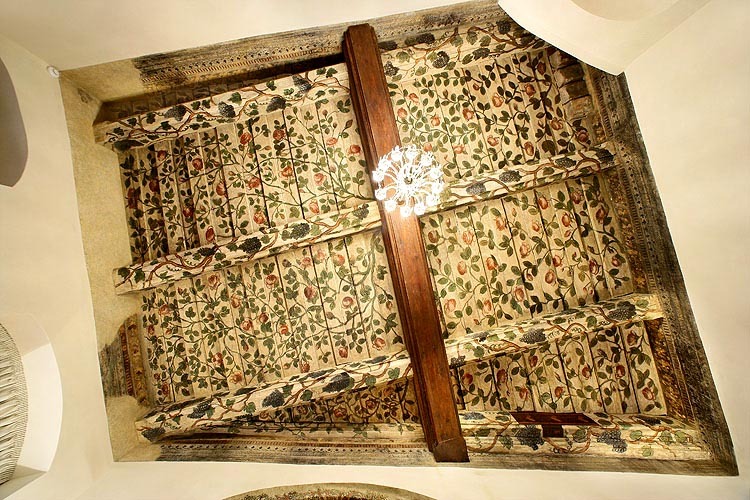 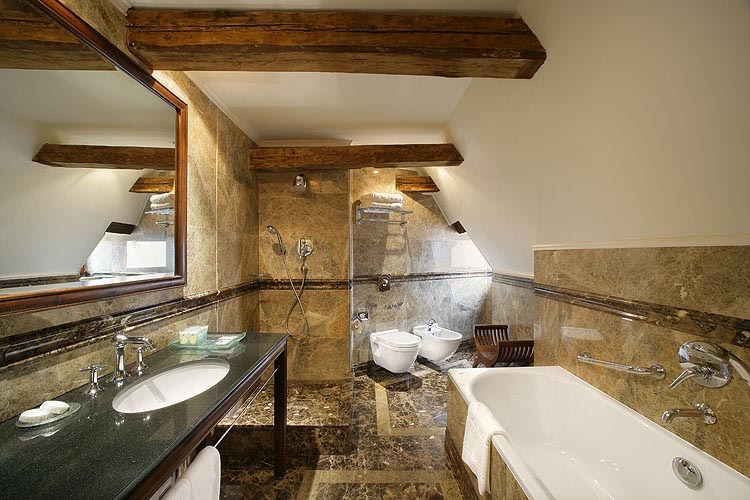 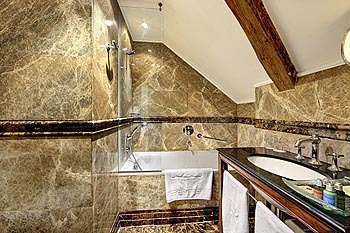 The rooms as well as beautifull marble bathrooms are newly renovated with all the modern facilities but without altering the 14th century look of original elements like wooden painted or vaulted ceilings or wall frescoes in some of the rooms. 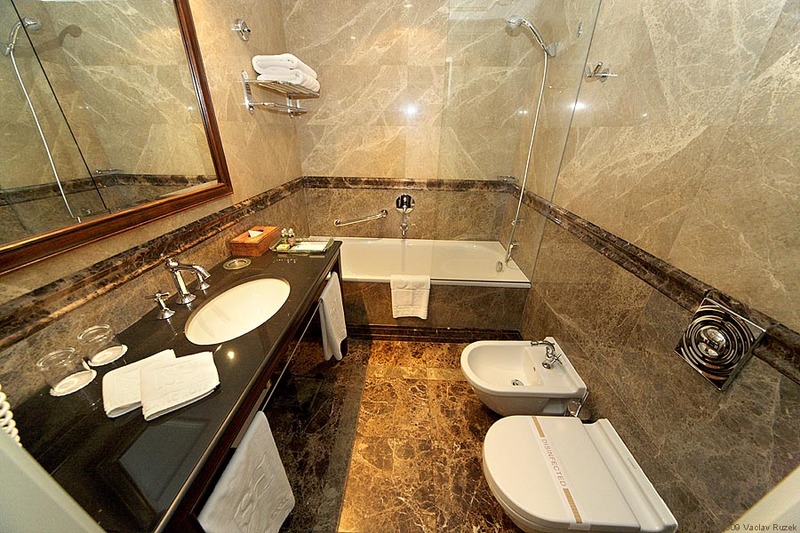 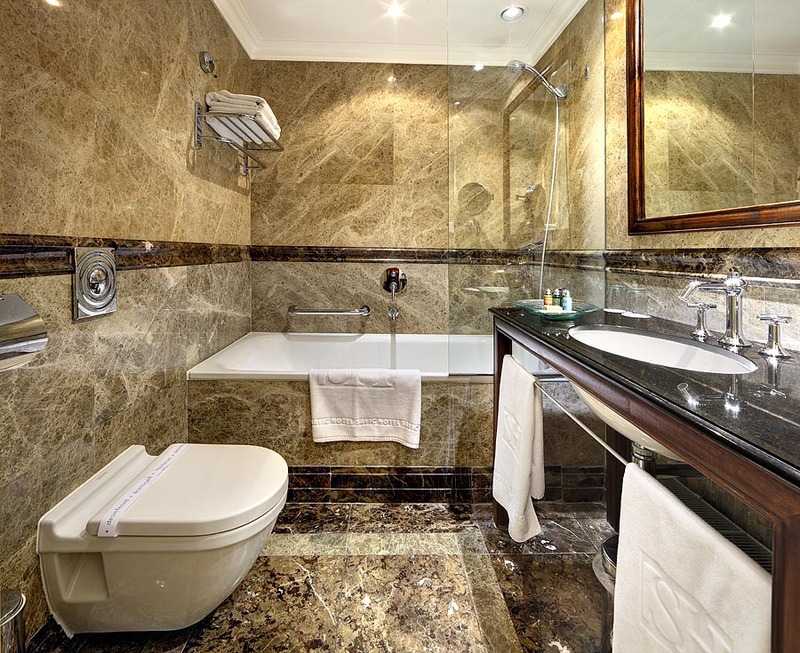 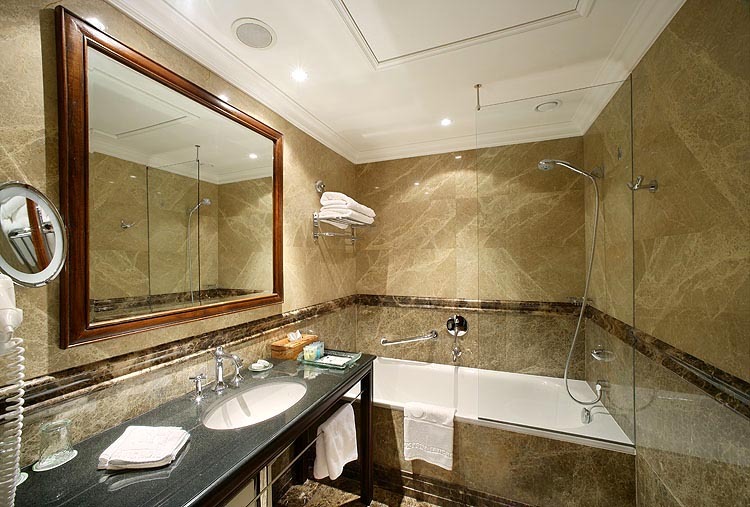 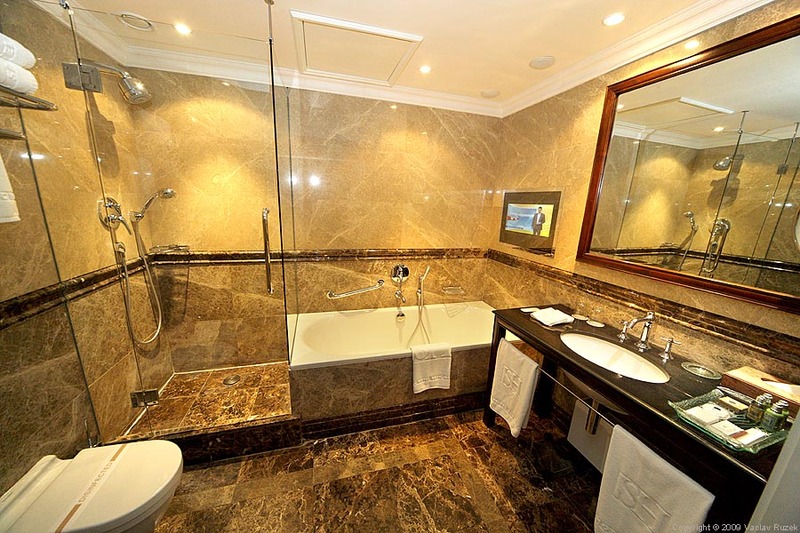 The suites have extra large bathrooms with both shower stall and bathtub, the suite no.204 (above pics) has even a TV incorporated in the marble tiling which you can watch while taking a bath. DeLuxe rooms category comprises 8 rooms, all are large (30-55sq.m.) 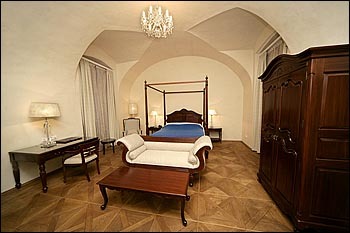 and each of them have something extra comparing to Superior rooms - 4 poster bed, painted ceilling, dressing room. 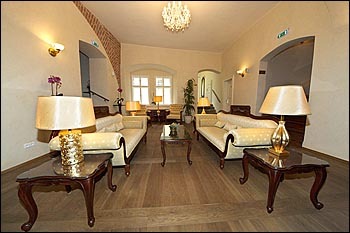 They offers also three types of coffees and teas, l´Occitane cosmetics, slippers and sofa. 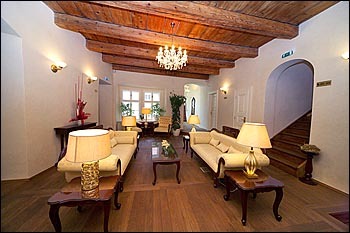 The amenities include an individually controlled air-conditioning system, mini-bar, coffee and tea making facilities (including own espresso machine in each room), direct dial telephone, personal locker, a spacious bathroom with a toilet, hair dryer, bathtub or shower, LCD TV with satellite paid channels, room service and free broadband Internet wireless or cable connection. 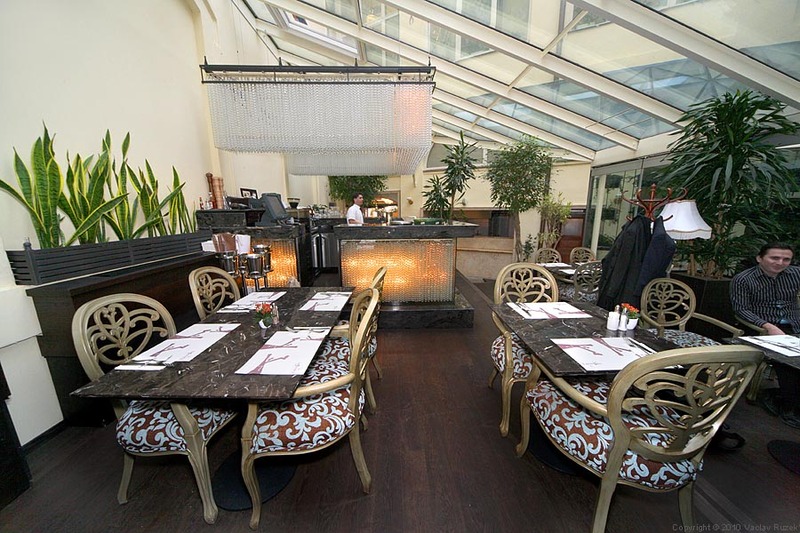 On the ground floor there is a breakfast room and a-la-carte Czech traditional and International cuisine restaurant called "U Dominikana". 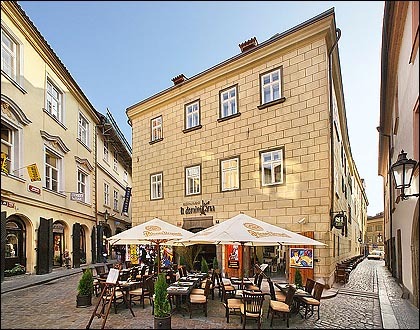 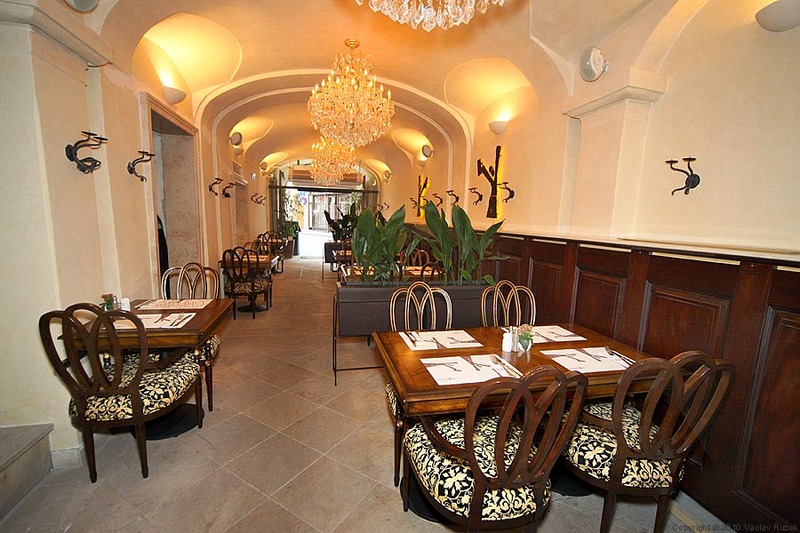 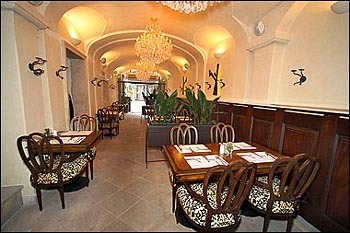 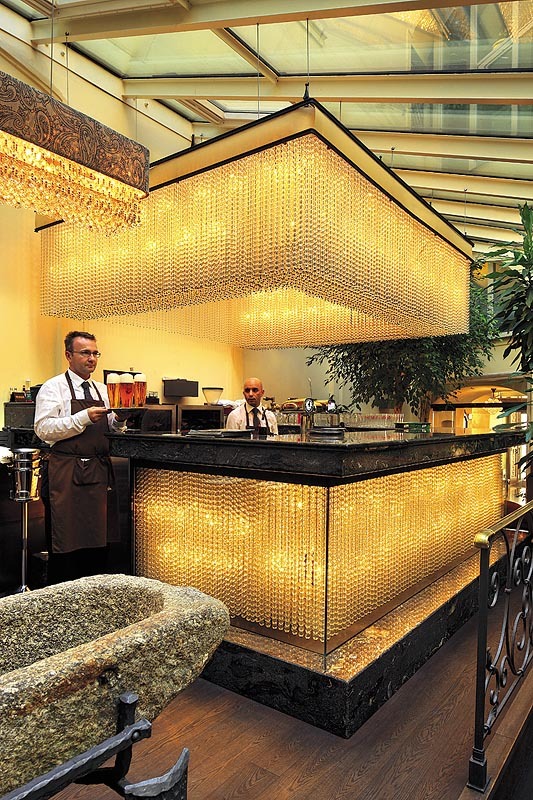 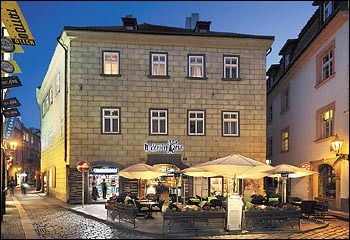 It has many International and Czech delicacies to choose from and also offers a wide range of wines and the famous Czech beer. 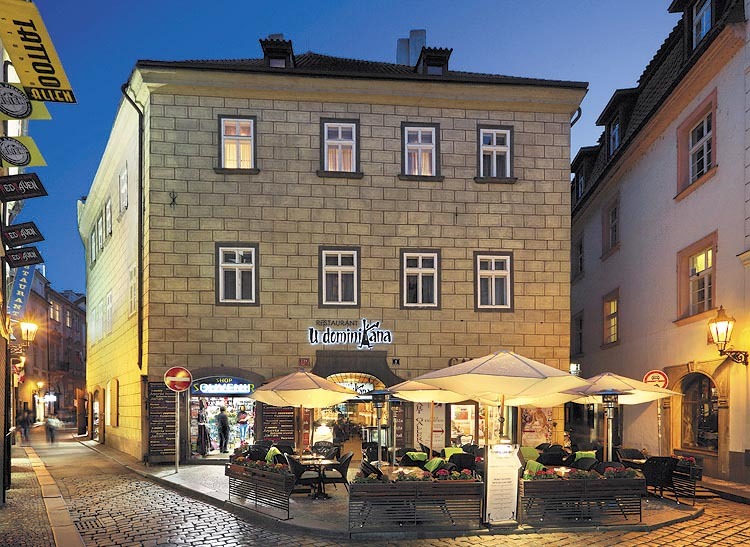 Our guests are granted 20% discount from the whole bill in the restaurant U Dominikana and 15% discount in the restaurant "Indian Jewel" in Tyn court at the Old Town Square. 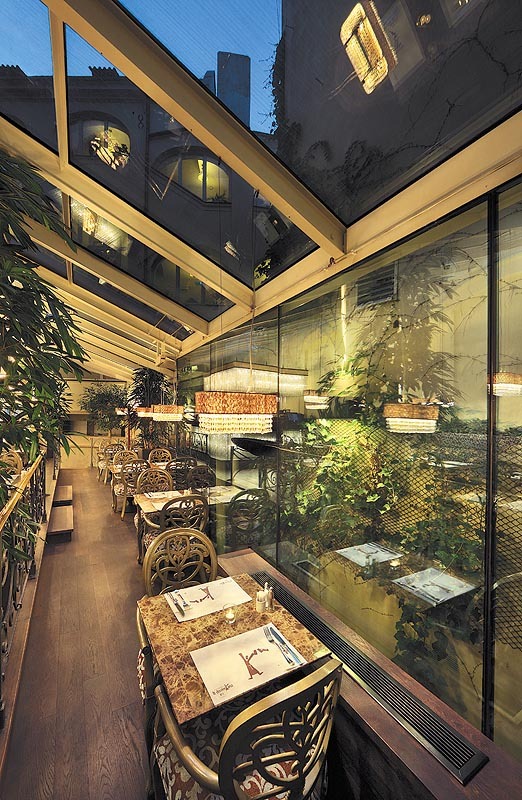 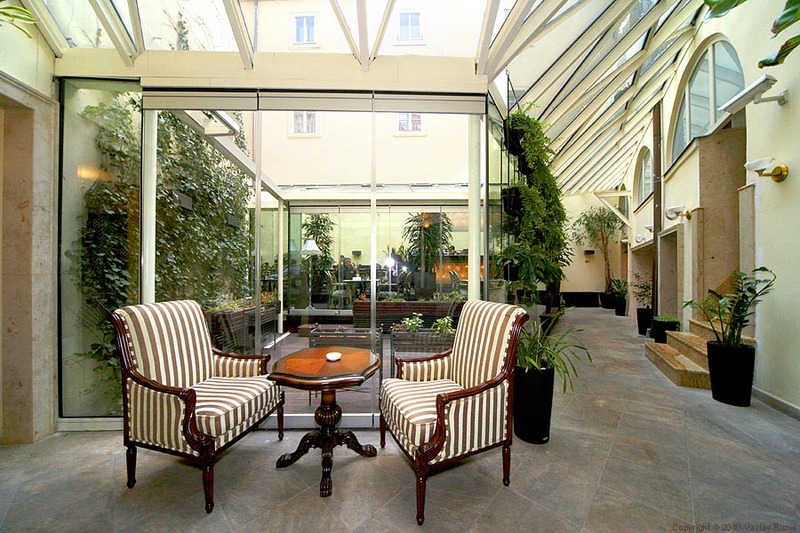 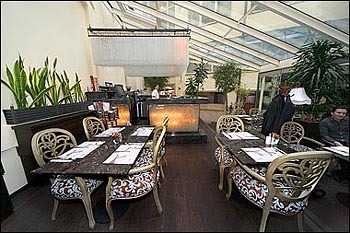 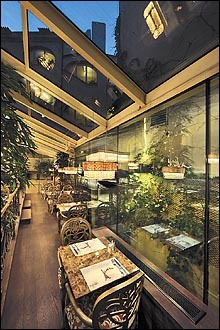 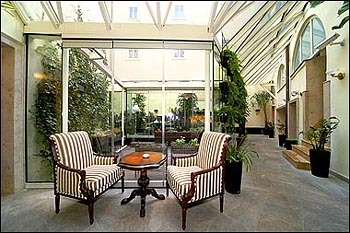 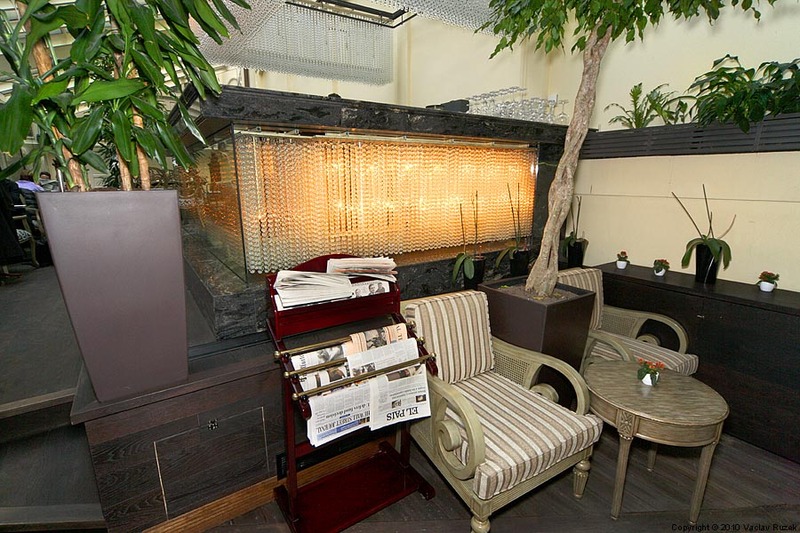 There is a small, unique courtyard in the centre of the hotel with glass roofed and in the summer partially open air restaurant for relaxation. The hotel has room service from 7:30 hrs to 23:00 hrs. 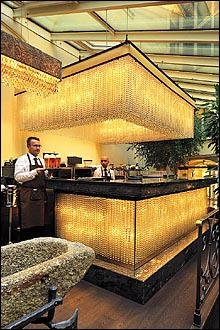 A buffet breakfast is served for the hotel guests from 7:30 until 10:00. 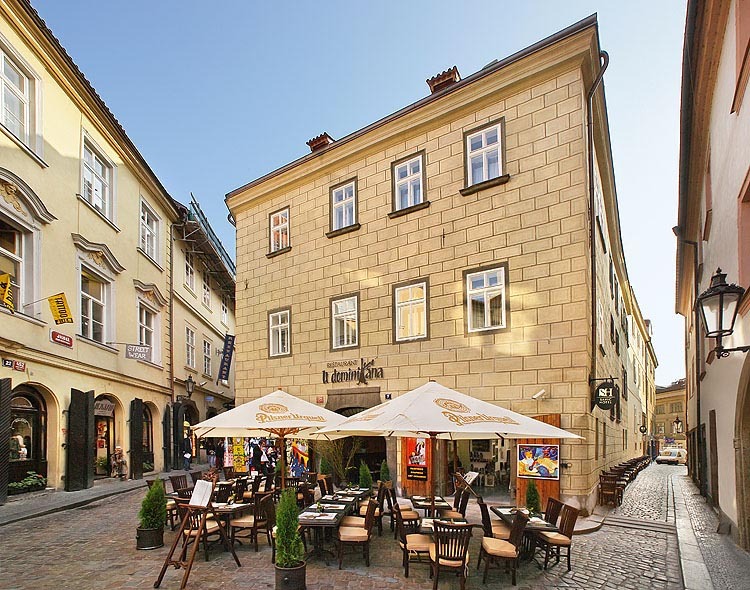 If you need a parking place for your car we can book a place in a closed courtyard 300 metres from hotel (across the Old Town square) - it cost 25 € per day and must be booked in advance via email, not at disposal in the reception. On each floor there is a spacious and comfortable furnished lobby, where you can meet your friends or family or just sit and relax. 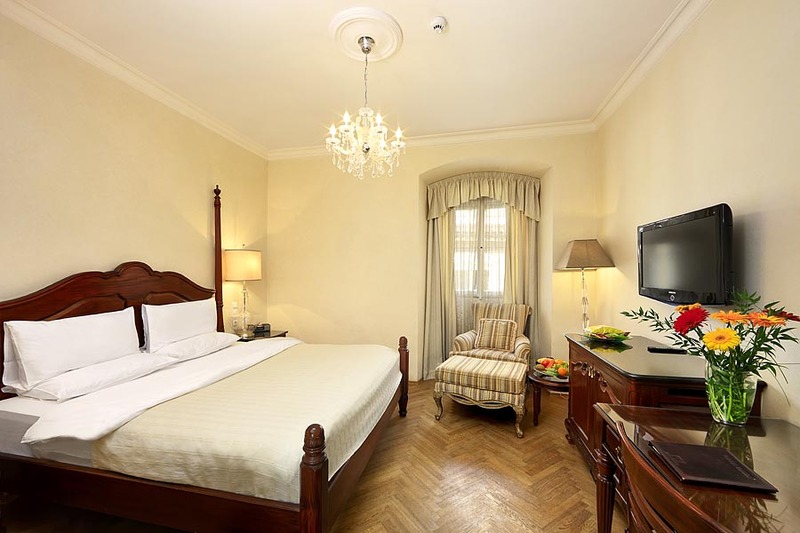 In all, the hotel ensures a quaint experience of living in a combination of the 14th Century ambience and comfort of modern amenities which will give you the warmth of home away from home! All offers are available for all room categories and they are not combinable. Prices include breakfast, welcome drink and all taxes. From 3 night stays we offer free transfers or other benefits, please ask us for an offer. 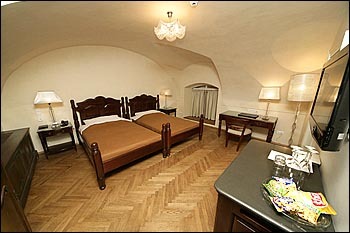 Children up to 8 years on extra bed or baby cot free of charge in room with 2 adults.